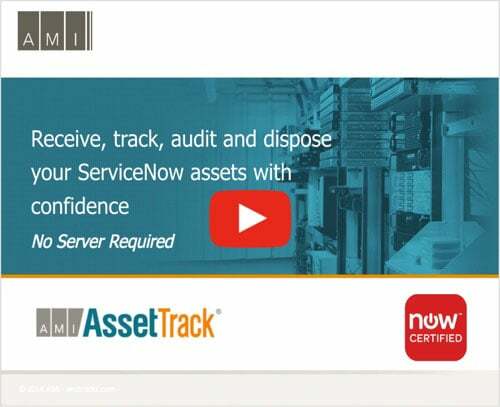 The only native ServiceNow certified platform application for barcode & RFID asset tracking. AssetTrack is 100% developed in the platform. No external servers, platforms, or services required. Maintain 99%+ accurate hardware asset data. Use AssetTrack to confidently respond to audits, avoid financial penalties, minimize risk, save money, and make important decisions quickly. Know where your assets are at all times. AssetTrack streamlines receive, track, audit and disposal processes so you always have the latest information. Barcode enabled receiving allows you to accurately pay invoices, know what’s coming due, minimize taxes and insurance, succeed audits, quickly correct problems, get people to contribute sooner. Update assets as they flow through your environment to avoid over purchasing, minimize maintenance costs, and budget and plan effectively. Quickly find and correct database errors to grow executive confidence, communicate accuracy with auditors, save time doing inventories, and reports are accurate and complete. End the asset lifecycle confidently to ensure data security, reclaim software licenses, recapture residual value, and avoid financial penalties.